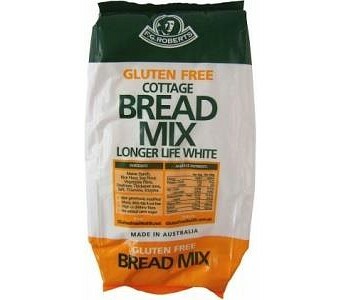 Roberts Cottage Bread Mix is ideal for commercial and home ovens. What's great about it is that you can make fresh loaves in home bread machines.This cottage bread mix is gluten free and makes great rolls, buns, pizza crusts, and high-top loaves for the whole family to enjoy. Dairy-free Nut-free Egg-free Potato-free High in fibre Low in fat No added cane sugar Kosher and Halal certified Ingredients: Maize starch, rice flour, soy flour, vegetable fibre, dextrose, vegetable gum (464), salt and enzyme.